There’s never a need to compromise between form and function. At My Flooring America, we make it easier to complete your remodeling projects. Whether you are re-flooring a single room or your entire property, luxury vinyl flooring in Webster, TX, has everything covered. Explore your options at our location and find the right products to meet your needs. At our flooring showroom, we are committed to providing a fun and hassle-free experience. We work hard to offer a colorful selection of flooring. Also, our showroom staff stays up to date with the latest developments in interior remodeling and design. You can discuss your ideas with us and leave with a plan. On top of that, we also facilitate luxury vinyl flooring installation. No matter the size or scope of your project, you can have confidence knowing you have the support of our team. Ease of Maintenance: Luxury vinyl is durable and non-porous, meaning it can repel dirt, water, and stains with ease. That means you will spend less time cleaning and more time for what you enjoy. Ready for Life: Active households deserve a floor that can keep up with them. Luxury vinyl has a pleasant underfoot feeling while also remaining strong enough to resist scuffs, scrapes, and impacts. Design Versatility: Thanks to modern manufacturing methods, luxury vinyl can take on the appearance--and texture--of premium flooring materials like hardwood, ceramic, and stone! It is also available in a stunning variety of colors and patterns. Planks: Luxury vinyl planks, or LVP flooring, is manufactured, cut, and shaped to look like solid hardwood. We offer plank flooring in the appearance of many wood species, like pine and mahogany. Tile: Give your favorite rooms a timeless appeal--all while simplifying your cleaning routines. 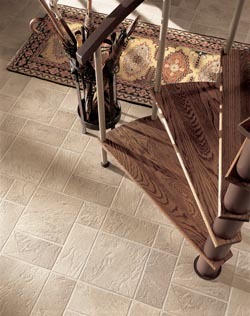 Our selection of luxury vinyl tile includes items that look like stone and ceramic, right down to the texture. You can even mix and match tiles to create new designs. Don’t forget: we’re here to ensure your selections look perfect in your home. Be sure to speak with us about our luxury vinyl flooring installation services. Our trained and experienced installation team will get the results you want, and according to your schedule. Contact us to learn more about our luxury vinyl flooring options. We proudly serve property owners throughout Webster, TX, including Clear Lake, Houston, Nassau Bay, Sea Brook, and the surrounding area.